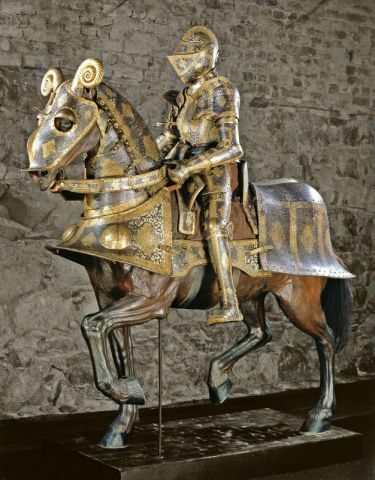 The warhorse was a vital part of the European medieval military machine. Cavalry charges by heavily armoured knights made horseback attacks a terrifying part of warfare, while horses’ capacity as beasts of burden allowed armies to travel further and faster than they could on foot. But how much do you really know about medieval warhorses? The control of land was fundamental to the medieval economy and politics. Rank, status and wealth all derived from it. So valuable were the best horses that by the 11th century swathes of land were being traded for them. 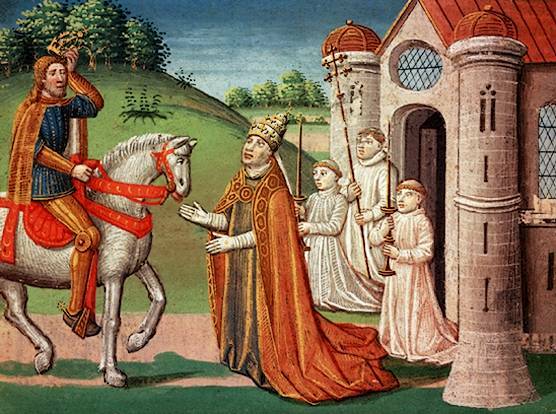 In 1030, the abbey of Jumièges paid the Count of Amiens six highly priced horses for territory at Genainville, while in the previous decade it bought land and privileges at Rouvray from the Bishop of Bayeux for the cost of a single horse. Tithes, the taxes paid to local churches, were commonly paid in whatever goods the payer grew on their land. As a result, tithes were sometimes paid in horses, and the Earl of Chester did this for twenty-four years from 1077 to 1101. Tribute to lords and kings could also be paid in horses, something monarchs used to maintain their own stocks. The distinctive heavy warhorses associated with knightly combat were a relatively late development, like the plate armour their riders wore. The Normans, who took knightly warfare to Britain, rode horses similar to Arabian mares. Around 15 hands high and with a slightly stocky build, they weighed 800-1000 pounds. It was only later that the truly massive horses would emerge. 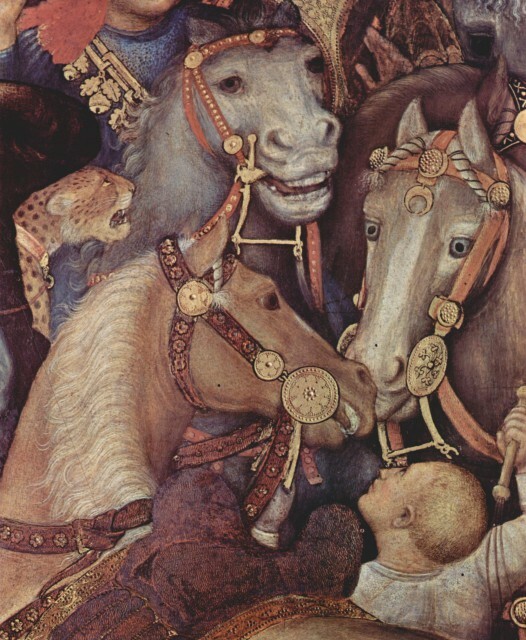 Detail from 15th-century painting by Gentile da Fabriano, showing curb bits, with ornamental bosses at the sides of the mouthpiece. Occupied by both Christians and Muslims, Spanish society was a melting pot, and so was its equine stock. Spanish horses were generally light and more agile than those bred elsewhere in Europe, but larger and heavier than Arabic horses. They were used to improve stock elsewhere on the continent. Transporting any goods over long distances was most efficiently done by water. Horses were best transported in different vessels from either the soldiers who rode them or the goods that would supply the armies. Norman armies learned from the Byzantines, using a ship called a dromond to transport their mounts. Images of this can be seen in the Bayeux Tapestry, with horses being led out of ships prior to the Battle of Hastings. 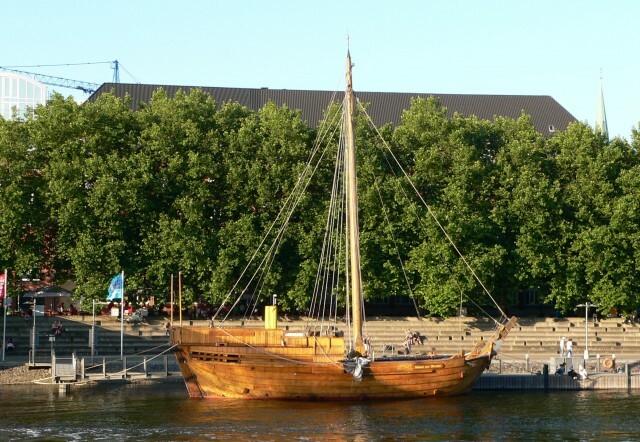 Specialist horse ships continued to be developed throughout the Middle Ages. In 1246, the crusading army of King Louis IX of France commissioned a dozen round ships from the dockyards of Genoa. These were to be fitted with mangers, stall rails and other equipment for the safe transport of horses on the Mediterranean. European men-at-arms rode in saddles that were higher up than those of Asian horse archers, with short seats and forward stirrups. This helped to create stability when riding and fighting in heavy armour, but it also limited combat options, forcing riders into a straight legged style of riding. Put together, this made it easier to deliver the strong lance thrusts and sword attacks that characterised knightly combat. But it also made it harder to tell how the horse was responding, and so to achieve the fast, agile manoeuvring of other horseback warrior cultures. Like people, horses varied from region to region in Europe. Aside from the famed Spanish horses, those of Hungary also had a reputation for being particularly fine, though they often suffered from cruel treatments believed to improve their performance, including slitting noses and heavy branding. Danish horses were small, beautiful and strong for their size, suiting the more rugged Scandinavian scenery. King Henry II of England was not content to ride a slow, ambling horse. A lover of courtly sports such as hunting and hawking, he rode a horse more inclined to trotting, as it would give him more exercise. 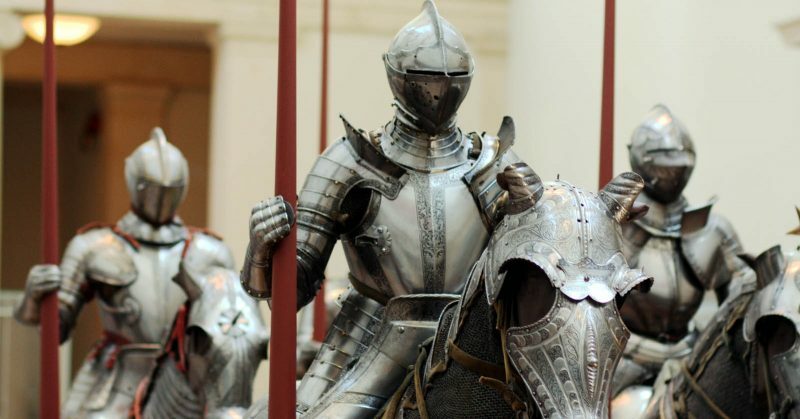 Horses were almost always a feature of a medieval army. They allowed soldiers to travel more quickly, and to arrive fresher for the fight. They were more important in this strategic role than on the battlefield. In 1151, Henry II was able to move his army more than 400 miles across the French countryside in six weeks, foraging and besieging castles along the way. Such a speed of advance would not have been possible without horses. Once they reached the scene of battle, soldiers often dismounted to fight. This was standard practice for Welsh and English archers when they were lucky enough to have mounts, and armoured men-at-arms sometimes dismounted to fight alongside the infantry. At the Battle of Crécy, all the English knights, and the majority of the French, fought on foot rather than attempt cavalry charges in tightly packed and muddy conditions. During the crusades, orders of religious knights were founded in the Holy Land, with rules influenced both by chivalry and by monastic orders. The rules of one of these orders, the Knights Templar, include over a hundred rules about how to look after horses and their equipment. The only activity that features more prominently in the rules is prayer and worship. The horses to be provided to senior Templars were even defined. Fighting far away from home, getting any sort of supplies could be difficult for crusading knights. Horses, being expensive, vital to warfare and hard to transport, were particularly important. Their opponents made the most of this, pillaging horses from Christian camps and grazing areas whenever the opportunity arose. Saladin, the most famous Muslim general of the era, established a unit especially for this purpose. He hired 300 Arab bandits, whose job was to steal horses and mules from the crusaders. For more information on medieval warhorses, try The Medieval Warhorse from Byzantium to the Crusades by Ann Hyland.